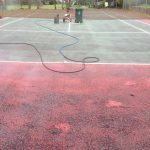 If you have an outdoor tennis facility, you will want to keep it in the best possible condition for safe use all year round. 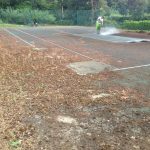 This can be done through regular tennis court cleaning, which we offer as part of our specialist sports facility maintenance services. 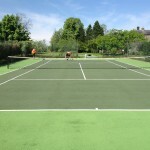 Depending on the type of surface you have, and the conditions of the court we can offer various cleaning and maintenance methods to prevent damage and fix any issues. 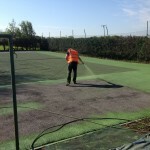 We specialise in general cleaning, moss and algae removal, damage repairs and resurfacing. We work all across the UK at various locations in different schools, clubs and domestic homes. 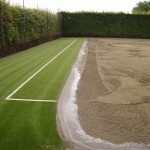 Our experts will be able to offer any advice and help you need when it comes to taking care of your sports facility. Please fill in the contact box on this page to get in touch with us and speak about costs for our different services. We will reply back as soon as we can to give you a quote for the work which needs to be done. 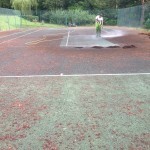 Porous Macadam Surfacing – This is one of the most common hard sports surfacing types. 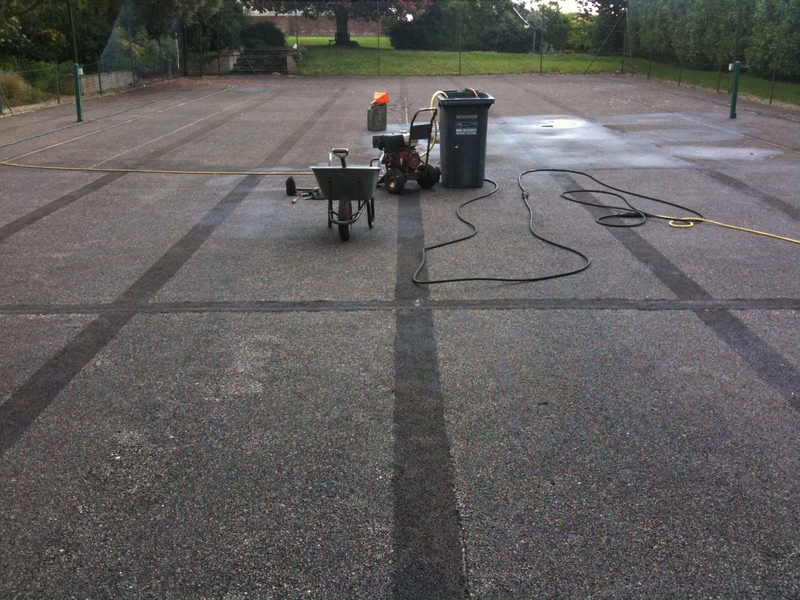 The cleaning process for a tarmac facility will usually be done to get rid of dirt and contaminants on the surface such as litter, leaves and moss. 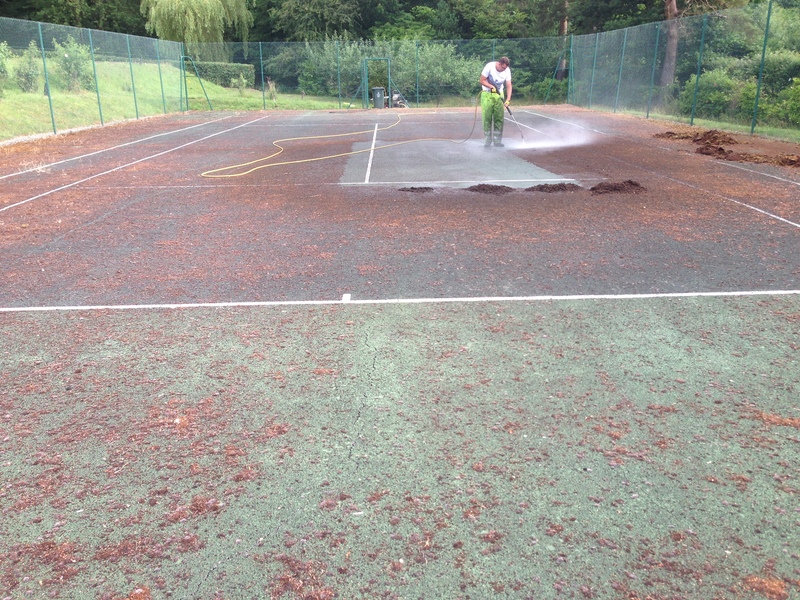 Our team can carry out a thorough professional clean using a specially designed tennis court solution which lifts up debris and pulls it away from the flooring. 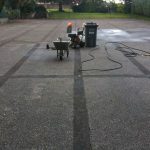 This is applied using a pressure washer which is angled to ensure it reaches each side of the macadam stones for an outstanding clean. Our company can also apply chemical moss and algae treatments to remove and prevent contaminations. Regular brushing should be done to remove dirt from the macadam floor and prevent it from getting stuck in the pores and causing flooding. 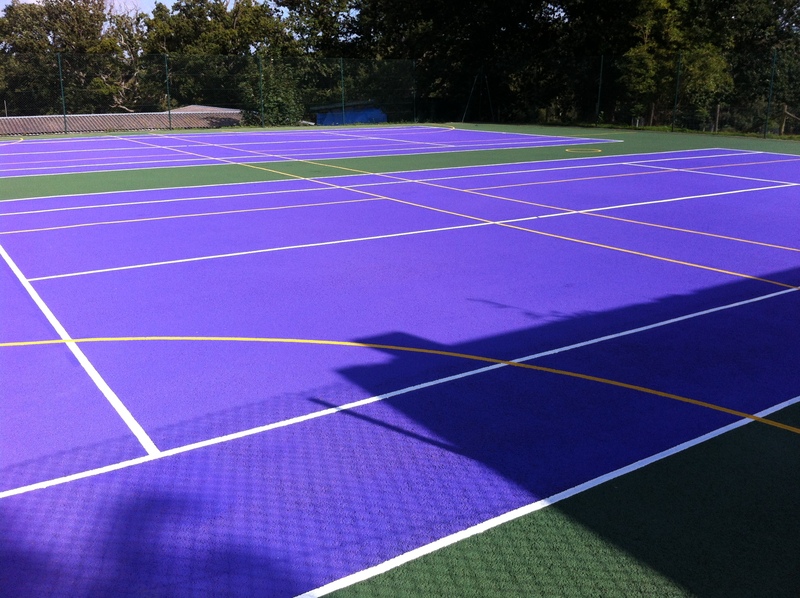 Polymeric Rubber – Another hard court specification which can be used for tennis. 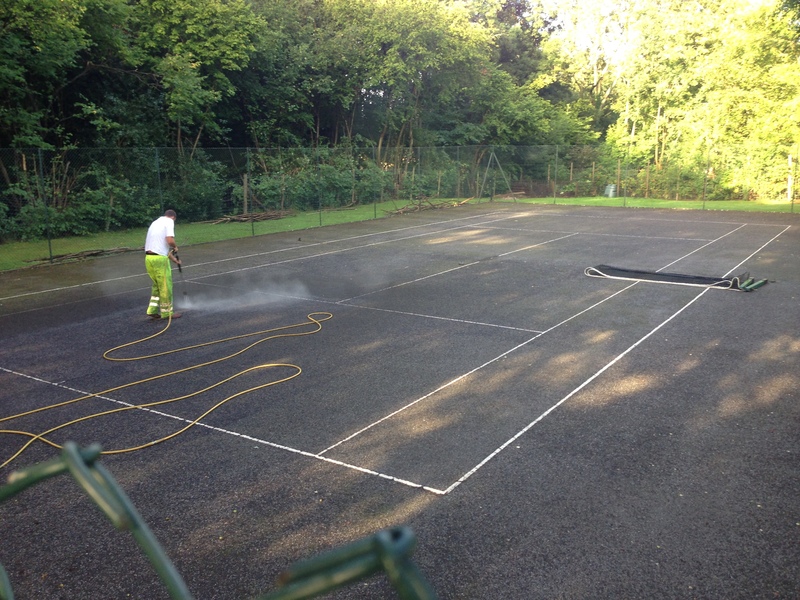 The EPDM rubber surfacing can be cleaned in a similar way to macadam courts, with pressure washing using a specialist solution. 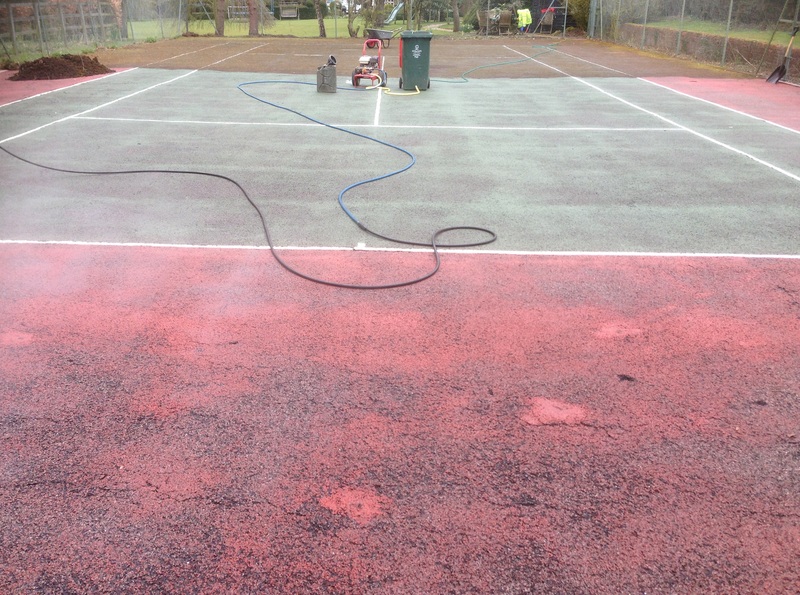 Moss and algae treatments are applied as part of the tennis facility cleaning process for polymeric sport surfaces as well. You should also brush the flooring on a regular basis to clean away natural matter and litter which might have fallen onto the area. 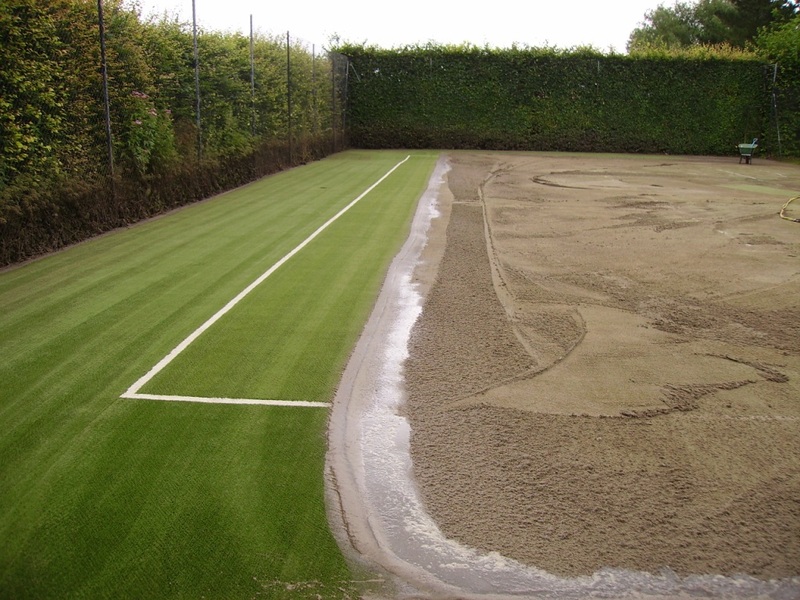 Synthetic Turf Courts – Sand filled artificial grass and Multisport synthetic turf can be used for tennis facilities as well. They require a slightly different method of cleaning which involves drag brushing through the carpet fibres to remove dirt and redistribute the sand infill. We can carry out a professional rejuvenation process if your artificial grass surface has become badly contaminated with moss. This involved extracting the dirty infill from within the pile and then applying a new layer of sand to hold up the grass fibres. For more information on different sports surfaces we clean and maintain, send us your details using the quick contact form on this page and we’ll offer you some professional advice regarding the costs! 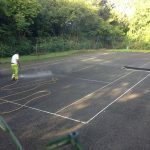 Our prices can vary for each project depending on area size, location, ground conditions and many other factors so be sure to give us as much detail as you can about your court. 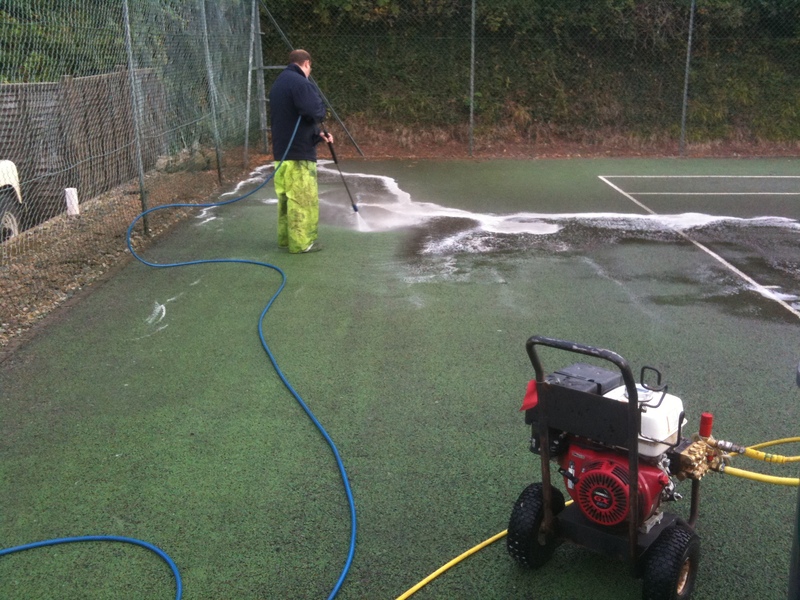 If you own a hard sports court which has become contaminated, we will carry out tennis surface pressure washing to remove the dirt. This involves using a specialist jet wash tool which sprays water and cleaning solution onto the ground to lift up debris. We will complete this process across the whole area, working in two directions to ensure that the flooring is completely clear from all angles. 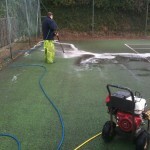 This cleansing work is ideal for removing moss, leaves and other contaminants which may be stuck onto the floor of your court. 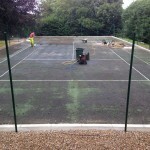 Below you can see some photos of our team completing tennis court cleaning work at various locations in the UK. We have worked at domestic homes, schools, sports clubs and many other places to offer this service. If you don’t thoroughly clean your sports flooring on a regular basis, contaminants can get stuck within the pores and lead to flooding. This is because the dirt affects drainage by blocking up the porous layers and stopping any water from soaking through and leaving the floor. Puddling of dirty water on the area can then lead to more contamination and moss growth which makes the area slippery and unsafe. It’s important to deal with these issues as soon as they appear to prevent the drainage problems from spreading. Completing a thorough cleaning process will help to reduce the chances of damage and help keep the area completely safe. This type of project is completed frequently by our experienced team, and we would be happy to provide you with more details on what we can do. 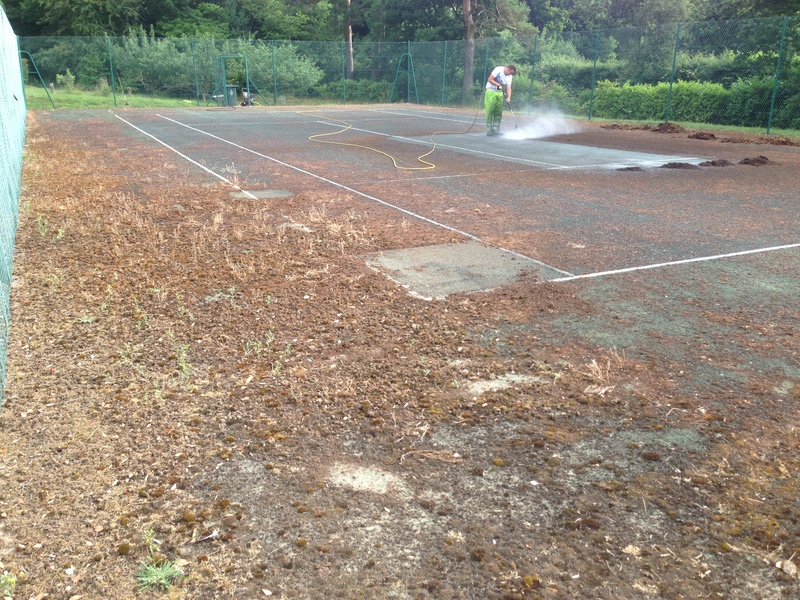 If you have an outdoor sports facility which is needs this sort of cleaning maintenance, please contact us through the enquiry form on this page. Our specialist team will be able to advise you on the best maintenance methods for your surface and we will carry out the work for a great value price. 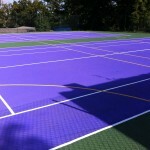 You can visit our website at https://www.sportsandsafetysurfaces.co.uk/ for more information on other services we specialise in for sports facilities. 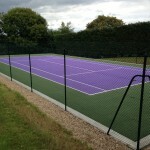 Feel free to get in touch with us if you’ve got any questions with regards to tennis court cleaning. One of our experts will be able to provide a quote for a thorough clean process along with some more information on what we do.